The summer solstice is upon us! What does this mean for us, how can we increase our enjoyment of this time of year, and what is a solstice anyway? The solstice, which is the longest day of the year for a hemisphere, is when either the northern or southern hemisphere is most tilted toward the sun. This happens in the northern hemisphere somewhere between 20 June and 22 June. For the southern hemisphere, the day occurs around 21 December. The solstice day is the day with the most hours of daylight each year. For most of human history, humans have taken note of solstices and their cousins the equinoxes. So much so, that holidays are clustered around them. It is no coincidence that Easter is near the spring equinox and Christmas is near the winter solstice. 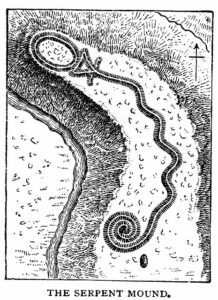 These important days have been celebrated in all cultures, and also allowed farmer know when to plant, when to harvest, etc… Many ancient monuments and tools may have been created in part to identify or acknowledge these times of year, for example Stonehenge in England and the Serpent Mound in Ohio. What can we do with our lawns, patios, and gardens at the (literal!) height of summer? First, given the increased hours of daylight, you may want to add or update an umbrella on your patio or out in the yard. Umbrellas provide shade, but can also add color and class to any area. With a wide variety of sizes, styles, and bases, you can even have several umbrellas in your yard. 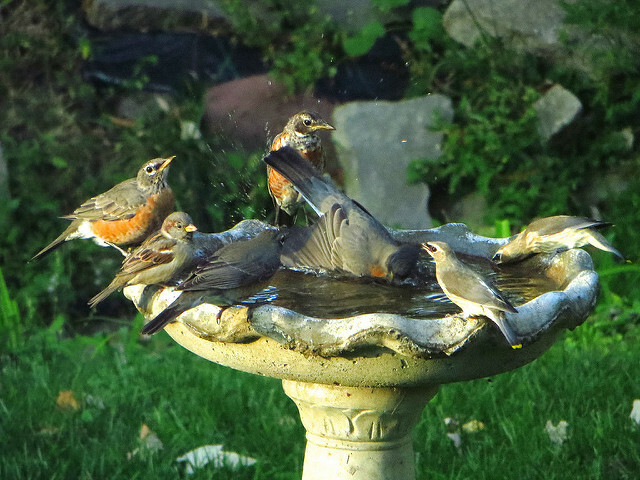 What better time of the year than the middle of summer to offer your avian friends a nice bird bath? Not only will they especially appreciate it during the heat of the summer, you will have more hours available to enjoy them. Photo Credit: Birdbath Party -2792 by Regan76 via Creative Commons License. Hats are extremely important for gardening enthusiasts in the middle of summer. When we really enjoy what we are doing, time passes a little bit more rapidly than we know. Discovering that you have been in the direct sunlight for 45 minutes longer than you planned can be dangerous, but much less so if you are wearing an appropriate hat. There are a variety of stylish hats available that offer varying degrees of protection. 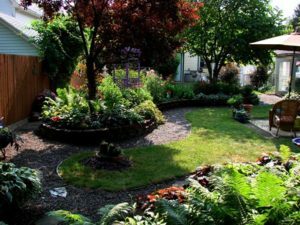 Of course, the nice weather of summer allows you to put nearly any yard or garden project into motion. Building a gazebo, installing a fountain, or adding lawn furniture can be done with plenty of light and long days. Make each summer a time to upgrade your surroundings! Backyard Garden in New York. Photo Credit: Backyard Bliss by Carol Norquist via Creative Commons License.